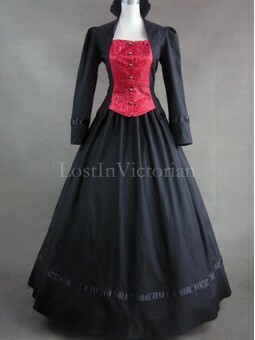 Fabric: Cotton, BrocadeShown Color: BlackIncludes: Bodice, SkirtThe hoop skirt (worn under the dress.. 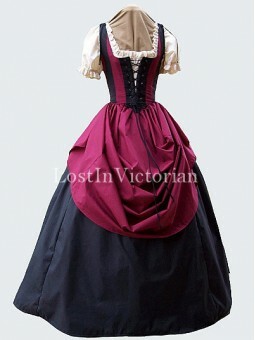 Fabric: CottonShown Color: Wine and BlackIncludes: Bodice, Wine and Black SkirtsThe muslin chemise, .. 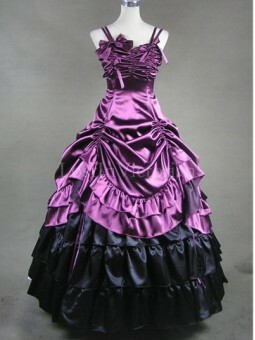 Fabric: Satin, CottonShown Color: Purple and BlackIncludes: Overskirt Bodice, UnderskirtThe hoop ski.. 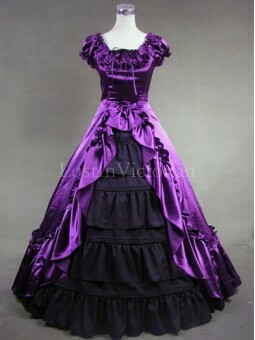 Fabric: SatinShown Color: Purple and BlackIncludes: Overskirt Bodice, UnderskirtThe hoop skirt (worn..